Attention all poker players! 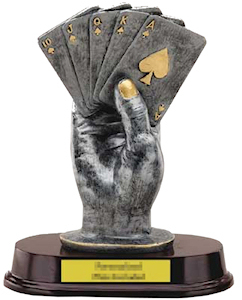 ALL-CON is hosting a Texas Hold'em tournament on Friday night at the convention. This is a friendly game with no buy-ins and plenty of fun. Players must be at least 18 years old. Managing the tournament for ALL-CON is Mr. Scott Kochenower of Quad-Kings Poker, an experienced organizer of professionally operated Texas Hold'em tournaments. There will be a trophy awarded to the 'last man standing' along with trophies for the next several runners-up. 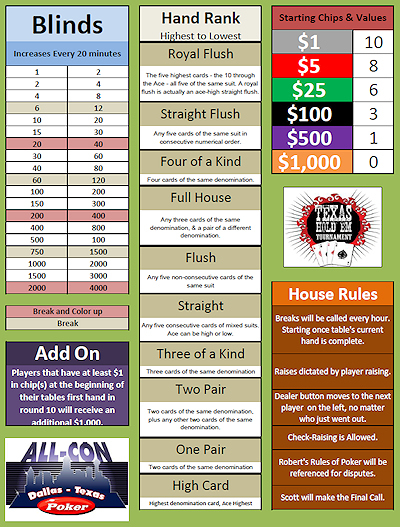 You can download your own copy of the ALL-CON poker sheet by clicking here.